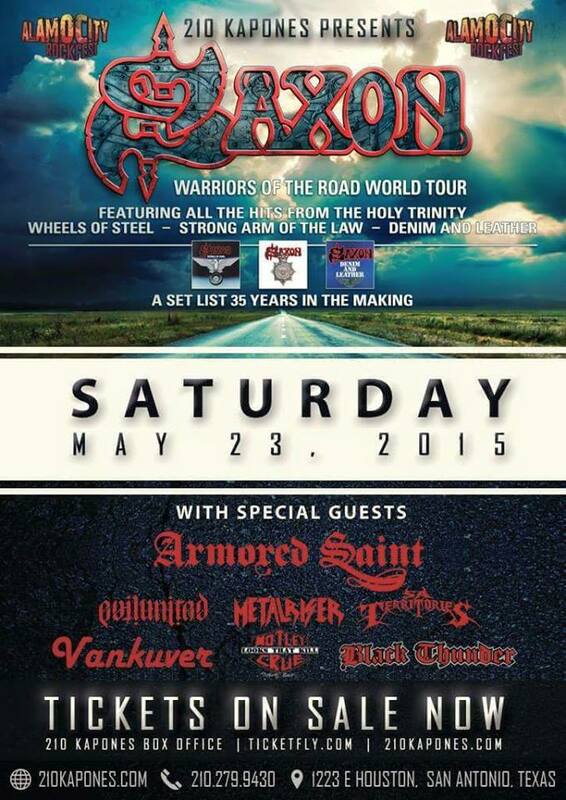 Three things in San Antonio have stood the test of time: Saxon, Armored Saint and Jason McMaster. Let’s just face facts, Saxon’s biggest USA fanbase is in Texas with the majority in the San Antonio area. Last night proved that. The weather was bad all day but I drove down and arrived at the venue pretty early to meet up Armored Saint/DC4/Odin guitarist, Jeff Duncan, who I hadn’t seen since the Odin reunion show in LA a few years back. We met when his band DC4 was in town for SxSW about 5 years ago. His brother, Shawn, and I have been friends for a few years prior and I helped them out when they were in town. Jeff and Jason met me at the back door of 210 Kapone’s and walked me in. While sound checking Armored Saint, I got to meet John Bush and the Sandoval brothers. I had previously met Joey Vera at the Arch/Matheos show a few years back. The Saint guys went back to their hotel after signing The Book (thanks, Jeff!) to rest and clean up and Jason and I hung out while some of the local openers were playing on the second stage. The crowd was starting to build around 730 and lots of friends were showing up. Jason’s thrash band, Evil United was scheduled to go on at 8PM. Thanks to Jeff, Jason and Saint’s manager I got an all access pass that was good though the end of the Saint set. Evil United hit the stage and opened with Dead Can See from their new album, Honored By Fire, followed up by three more from that album. They went back to their self-titled debut for Dawn of Armageddon. The 30ish minute set was capped by a brutal cover of Judas Priest’s Tyrant. The crowd was into the set from the first note to the last. Jason is highly regarded in San Antonio because of his work with Watchtower and Dangerous Toys. He’s consistently flown the metal flag in Texas for 30+ years. Evil United sounded great. Don Van Stavern’s bass was crushing through the mains. I especially like EU’s drummer. That dude is pretty much a badass. The band was tight and the set was too short, but such is life. Jason has a long history with Armored Saint dating back to the early 80s and had remained friends with them since then. It was great seeing them hang out together. Armored Saint was using EU’s backline so there wasn’t much of a changeover between bands beyond changing cymbals out and switching guitar pedal boards. They hit the stage around 855 with the title track from their new album, Win Hands Down. I like this song a lot and have listened to it several times since the single was released. They totally got the crowd going with March of the Saint and Nervous Man. Bush’s vocals were spot on and Jeff’s backing vocals sounded great. The guitar tandem of Jeff and Phil Sandoval is pretty crushing. The whole band was extremely tight and their setlist spanned every album. Symbol of Salvation is my favorite album and their played Reign of Fire and Last Train Home. The increasingly growing crowd was totally into their 11 song set that closed with Mad House from March of the Saint. Of course Can U Deliver elicited the greatest response. I had never seen Saint before and last night’s show was great. Just what I needed! After their set I went back to Saint’s dressing room for a bit to hang with Jeff and Jason. I didn’t want to be all up in their business as it was pretty humid in there last night and those guys put on an intense set so I knew they were a bit worn out. Bobby Jarzombek was up there and was having a discussion with John Bush about whose Mexican food was better, LA or San Antonio. It was pretty humorous. Saxon was up next and it’s well known around here that I am not a fan beyond 3 songs or so. I just could never get into Biff’s voice, their lyrics and their riffs. Believe me, I have owned several of their album to no avail. They hit the stage to a seemingly capacity crowd opening with Motorcycle Man. They ran through what most would consider their most popular songs. I watched one song and went back to the room where the second stage was to sit for a while as it was vacant and I sit down. Ran into other friends out there and listened to the remainder of the show from a distance. I heard Dallas 1PM, Princess of the Night and the closers Strong Arm of the Law and Denim and Leather, and that was plenty for me. I was just bored and couldn’t wait for the show to end so that my friends and I could grab a late meal and hang out for a while at one of their houses. Saxon, however, did sound tight and the crowd was completely into it from beginning to end. That will likely be my first and last Saxon show. Don Van Stavern, Bobby Jarzombek and Joey Vera discussing life.